Fun Fierce Fabulous Beauty Over 50! : Beauty ~ FEELsoREAL™ Synthetic Hair Extensions by Effortless Extensions! Plus a Live Giveaway! 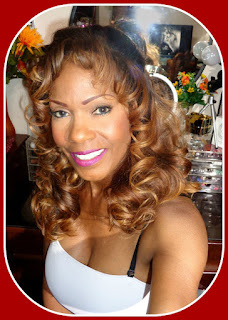 Beauty ~ FEELsoREAL™ Synthetic Hair Extensions by Effortless Extensions! Plus a Live Giveaway! I had the pleasure of reviewing one of the most popular hair extensions out on the market today from the exclusive brand Effortless Extensions. One of the major features of these hair extensions is that it doesn't require the use of any clips, tape or glue. These extensions are completely worn without causing any damage to your natural hair! 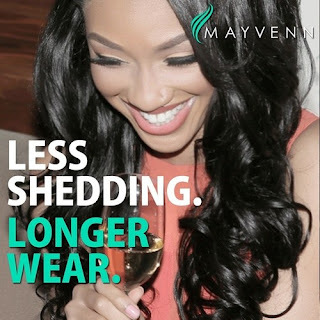 Effortless Extensions are sold exclusively online in a variety of stores worldwide. You can also find them online in Sally's Beauty Supply! These extensions are a favorite among celebrities and TV personalities and are a must-have for our everyday beauty needs. I was very excited when my package arrived. I have never worn these types of extensions and I was very eager to try them. The hair was packaged very securely and had a pleasant scent. I was able to take the hair right out of the package, photograph it and immediately try it on without any problems. Inside the package is a very beautiful carrying case made out of pink velvet. This pouch is such a great idea for safely storing your extensions when you're not wearing them. I imaging it would also come in handy as the perfect storage case while traveling. I counted six rows of hair attached the the net which makes it very thick and full. I don't think you need more than one package to achieve a variety of different looks. The hair can also be custom cut to blend in with your natural hair pattern. You can also curl, blow dry or straighten the hair without causing any damage. A clear monofilament wire secures the extensions in place around the top of your head. FEELsoREAL™ synthetic hair is heat resistant and can take temperatures up to 480 degrees. 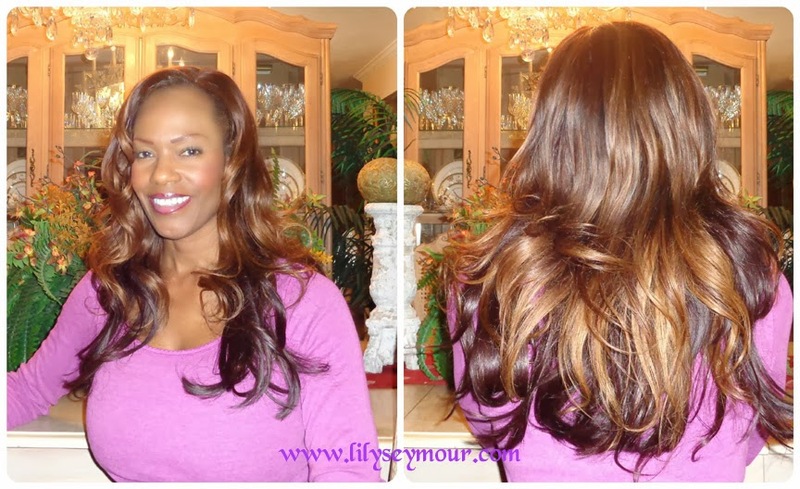 The extensions are 16" in length and can be worn at the nap or higher for different styles. The extensions should be matched from the ends of your hair to achieve a perfect blend. The hair returns back to it's original shape after washing, no twisting or wringing required. Silky Smooth Textures: FEELsoREAL™ Synthetic is perfect for women with silky, smooth hair. This pattern comes in three textures: Straight, Flare and Body Wave. Course Curly Textures: FEELsoREAL™ Synthetic is perfect for women with textured or course hair. This pattern comes in four textures: Straight, Soft Rod Curl, Wave Curl and Wet and Wavy. The hair comes in a variety of colors ranging from light to dark. I ordered Synthetic Body Wave in Auburn. Although I didn't order a color that matched the ends of my hair, I don't think it looks that bad. For some reason I ordered Auburn because I was trying to go for an ombre effect, but as you can see it was considerably darker than what I actually needed. Just remember if you want a perfect match, be sure and order the color closest to the ends of your hair. I did cut about 2" off because it was just too long, but I love the natural wave and how effortlessly it was to put on and style. 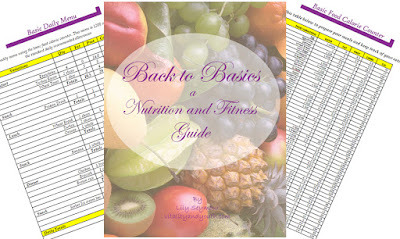 Find Effortless Extensions on Facebook, Twitter & Pinterest! One luck person will receive a FEELsoREAL™ Synthetic Effortless Extension Hair Piece! Don't Forget to Leave a Comment Below! Disclosure: Fun Fierce Fabulous Beauty Over 50 is not responsible for prize fulfillment. The product(s) in this post was sent for consideration, all opinions are my own. This giveaway is not associated with Facebook, Twitter or Pinterest.